Crusty, salty home made soft pretzels, hot from the oven. Recognize rule #39? Of course you do – it’s from Michael Pollan’s Food Rules, An Eater’s Manual. I don’t know about you, but life is plenty complicated as it is – the rules in this book are just my speed. “There is nothing wrong with eating sweets, fried foods, pastries, even drinking a soda every now and then, but food manufacturers have made eating these formerly expensive and hard-to-make treats so cheap and easy that we’re eating them every day. The french fry did not become America’s most popular vegetable until industry took over the jobs of washing, peeling, cutting, and frying the potatoes – and cleaning up the mess. If you made all the french fries you ate, you would eat them much less often, if only because they’re so much work. I like it. Plus, I can be sure the ingredients are of the quality and provenance I choose. 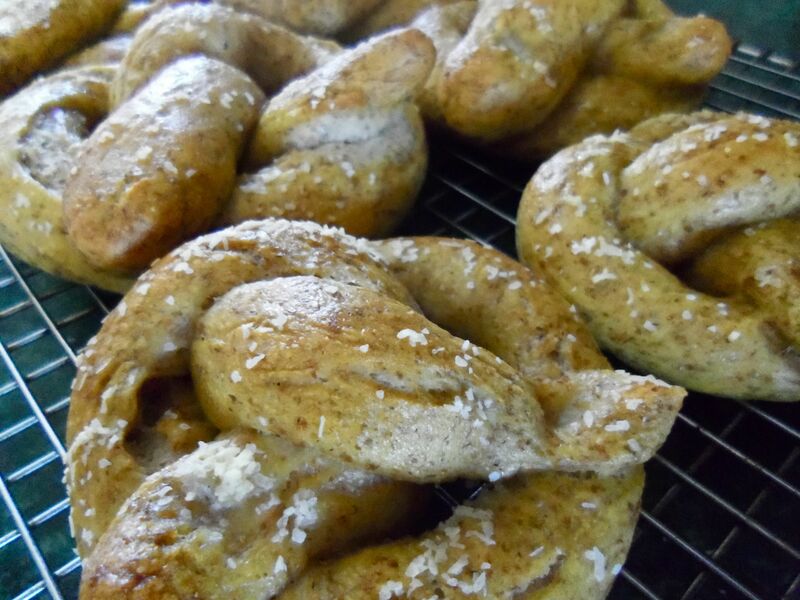 Soft pretzels are a perfect real food snack for a non-industrial pantry. For lots of reasons. They’re baked, not fried. They’re wholesome & filling. And pretty yummy if I do say so myself. 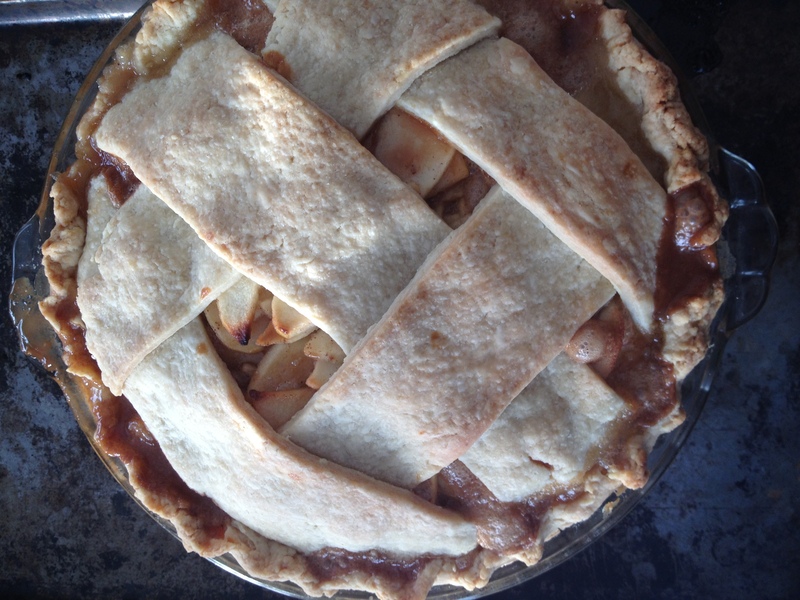 I love this recipe based on one in The Martha Stewart Living Christmas Cookbook. Love her or hate her, when it comes to real, good, timeless food, Martha delivers. Really, I don’t know why this book is handicapped with the holiday label – it’s a great reference for any special cooking occasion, all year-long. This recipe has a secret: poaching the pretzels in water & baking soda for that critical chewy exterior just like the commercially baked ones. Click here for the printable recipe. 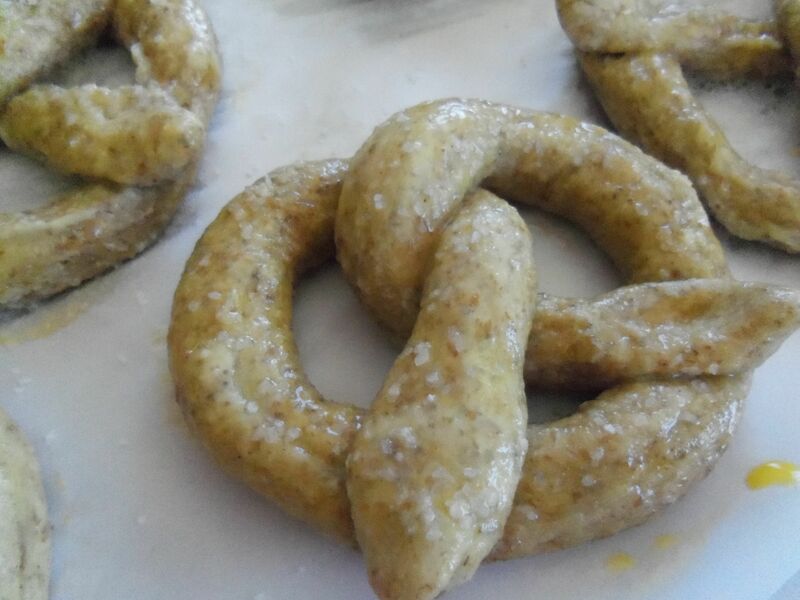 Pretzels poached, shaped, brushed with egg wash & sprinkled with salt. I like to make this recipe all the way to just before baking, freeze the unbaked pretzels overnight in a single layer, then package the frozen pretzels two to a small freezer bag. Later, you can bake them up straight from the freezer in just 15 minutes for a warm, salty, crusty treat perfect with mustard or cheese sauce. Fast Food of the Slow Kind… stretching the Food Rules?? < Previous beatrice: braveheart, bold or just plain bad? I love it when I come across validation for my opinions. I hadn’t read Pollan’s book, but I have always instinctively applied this rule and believe it is a good one. When snacks and treats are too accessible it is WAY to easy to overindulge. I like to make them myself and enjoy them immensely. 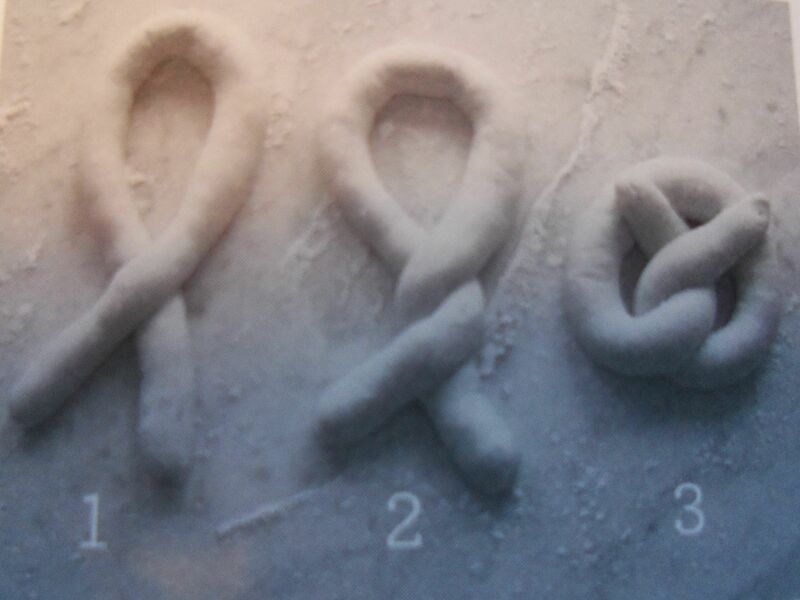 The pretzels look fabulous!! Thanks for posting. Thank you for the visit. I do think we all really know this stuff, but prefer to ignore it. I did subscribe to this belief until I was diagnosed with gestational diabetes. Then after evaluating what I thought of as our “real food” diet I found we were still eating a lot of sugar; even though it was honey, maple syrup or molassas. In addition to curbing sugar I also had to rebalance where my calories were coming from in regaurd to protein, carb or fat. Luckily I had already won the mental battle accepting that fat was okay if it came from the right sources. I did have to learn about carbohydrates and why they shouldn’t be consumed in quanitity. I’m a sucker for bread, but now it has to be one slice of bread with almond butter or even just butter to keep my blood sugar in a good range. I have changed my belief that any homemade food is okay. Somethings will always need to be in moderation, even if made with home milled, whole wheat flour. You’re absolutely right; no one simple rule holds true for everyone.